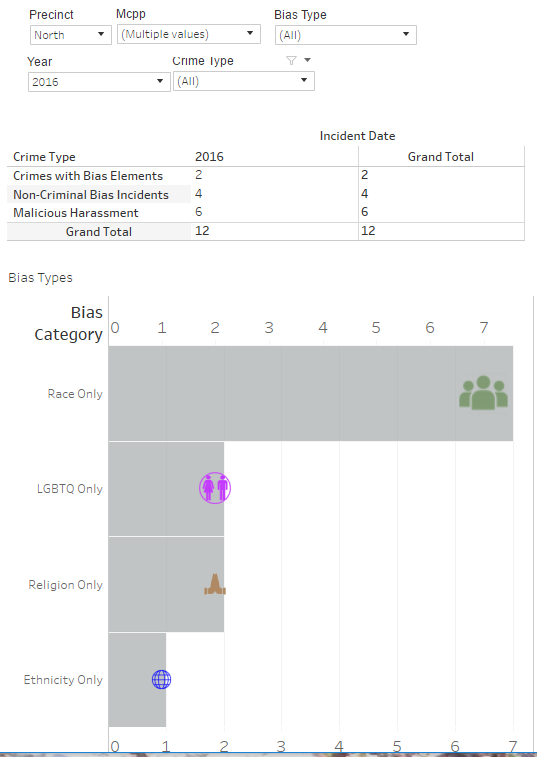 Seattle Police Department publishes a bias crimes dashboard at its website. You can choose the year, the precinct or neighborhood, and types of bias crimes, then view a bar chart. SPD defines neighborhoods such that the part of Pinehurst west of 15th Ave NE is in the Northgate Micro Community Policing Plan (MCPP) and the part east of 15th Ave NE is in Lake City’s NCPP. Therefore, I made the chart below show 2016 bias crimes in both Northgate and Lake City MCPPs. The webpage is here if you want to use it yourself. There is no data yet for 2017. Is bias crime synonymous with hate crime? Yes, the SPD website’s title is Bias/Hate Crime Data. Any date on 2015 or 2014? Yes, the dashboard lets you see 2014 and 2015.